Scoutreach offers the Scouting experience to youth in under-served areas through financial assistance and professionally trained leaders. At the challenge of the Cobb County Chamber of Commerce, the Atlanta Area Council is moving forward with a massive increase in Scoutreach programming in Southern Cobb County. Scoutreach is a division within the Atlanta Area Council with an emphasis to recruit passionate adult leaders and to develop strong relationships with organization in urban, suburban, and rural areas, removing barriers to ensure that all youth have the opportunity to join Scouting. The Atlanta Area Council is dedicated to insure that every child has an opportunity to join Scouting, no matter their circumstance. Scoutreach assistance can provide camperships, uniforms, handbooks, transportation, and leadership of a Scout unit. 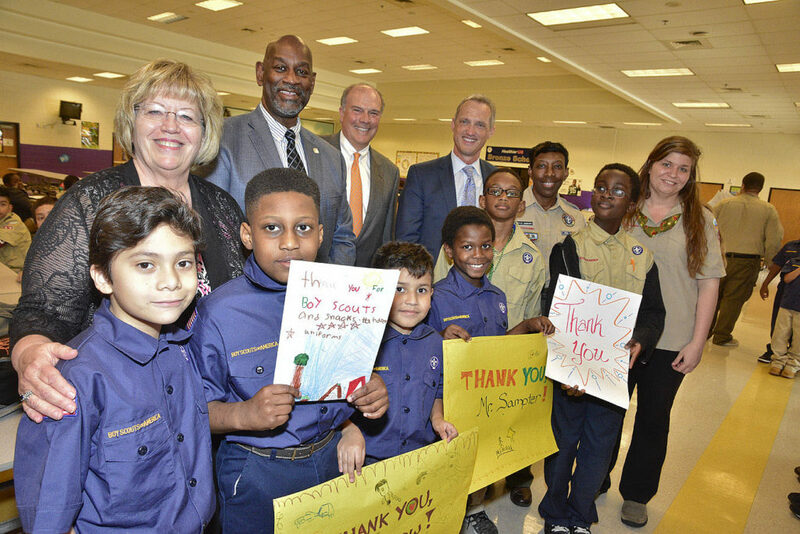 Scouts from Riverside Intermediate School in southern Cobb County thank the community leaders, teachers and Scouting Professionals that support their Pack. South Cobb Committee Chairman Brantley Barrow assembled a team of donors and volunteers to create new Scoutreach Units in schools throughout southern Cobb County. Former Scouts like Home Depot Regional VP Chris Waits were more than willing to volunteer their time, talents and funds to support the effort. Together they are bringing the promise of Scouting to youth who might otherwise never have the opportunity to participate in the program. To learn more about Scoutreach programs benefiting under-served youth in the Atlanta Area please click here. Tagged scoutreach. Bookmark the permalink.